Our Future Rooted in Our Past: Would You Like To Meet A New Cousin? Would You Like To Meet A New Cousin? I remember the first time that I actually was in contact with a new distant cousin. I found it was exhilarating to meet someone who was looking for the same family groups and was my cousin, albeit a distant cousin. The workings of genealogy/family history can be an isolating task, but when you finally connect with someone who is in your family line it is like Christmas morning. I have had several successes of meeting and sharing data with some of my distant cousins. To date, I have found three distant cousins in the UK, one in New Zealand, and one in my home town. It was from the cousin, Gil Nielsen that I blogged about previously who helped me find another great tool for those of us researching our Danish family lines. 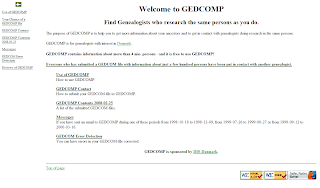 GEDCOMP is designed for those researching genealogy in the kingdom of Denmark as it is structured currently and also includes the areas that previously belonged to the kingdom of Denmark, including Norway, Iceland, Schleswig-Holstein, Skåne, Halland and Blekinge. It also includes information regarding European Royalty. Mr. Lars Ludin is the genius behind this project which began as an experiment when he was in graduate school. According to the New York Times review completed by Peter Wayner, he stated the following: "Mr. Lundin's work began as an experiment when he was a graduate student in applied mathematics at the Technical University of Denmark. A fellow amateur genealogist suggested that it would be impossible to create a database that contained information on everyone who has ever lived." What began as a mathematical experiment has benefited thousands of individual researchers trying to connect with their Danish roots. As of today, November 26, 2008, there are over 4.2 million names in this database. The website is designed for one to submit their GEDCOM (GEnealogy Data COMmunications) file that is created by utilizing a genealogical program such as PAF, Family Tree Maker, Ancestral Quest, etc. Once you have the GEDCOM file created it is then submitted via email to Mr. Lars Lundin. He utilizes his computer software to analyze the file and then you are sent an email providing the contact information (email address) of others who have submitted their files and are researching the same names. This service is completely free and works great in connecting you with others in your family tree. The only stumbling block one might experience is the language barrier as the emails returned are in Danish; however, this is easily overcome by utilizing any one of the translation sites located on the internet such as GramTrans, Google, etc. Note: I am very protective of private (living) data therefore I sent a GEDCOM file starting with my grandparents to protect private data. Many of the genealogical programs provide a feature where you can privatize the file prior to creating a GEDCOM, but if yours does not, I would create the GEDCOM from your Grand or Greatgrandparents on back if you are concerned about privacy. If you would like to read the NY Times review by Peter Wayner, click From Shared Resources, Your Personal History. If you would like to jump in and research further regarding the opportunities that await you with GEDCOMP, click GEDCOMP (English Version). You can view the site in the native language of Dansk by clicking on the Danish Flag on the home page. Have fun connecting with cousins!